Bangalore — Texas Instruments (TI) (NASDAQ: TXN) today introduced a four-channel buck DC/DC converter with PMBus/I2C digital interface for applications in space-constrained equipment that experience high ambient operating temperature without cooling, such as small cell base stations, infotainment and solid state devices. The TPS65400 dual- or quad-output configurable DC/DC converter integrates eight power MOSFETs and features industry-leading efficiency at up to 95-percent in the smallest footprint. For more information, samples and an evaluation module, visit www.ti.com/tps65400-pr. 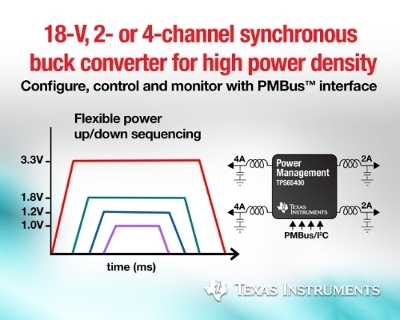 The TPS65400 includes four high-current synchronous buck switching regulators with integrated MOSFETs. Each switching converter supplies a 2-A or 4-A output to efficiently power digital circuits such as the processor, FPGA, ASIC, memory and digital input/output. Switching frequency for the converter is independently adjustable up to 2.2 MHz. The TPS65400, which can be powered from a single-input voltage rail between 4.5 V and 18 V, supports applications running off a 5-V or 12-V intermediate power distribution bus. Flexible power up/down sequencing control increases system reliability. Read a blog on sequencing for performance processors and FPGAs. Parameter configuration and status monitoring via PMBus enhances system intelligence. Dynamic voltage scaling optimizes processor performance. Phase interleaving reduces input capacitance and ripple. Current sharing supports higher output current and enhances design flexibility. Small 48-pin VQFN package measures 7 mm by 7 mm by 0.9 mm. Available in volume now from TI and its authorized distributors, the TPS65400 is offered in a 48-pin, thermally-enhanced VQFN package and priced at US$3.68 in 1,000-unit quantities. Order theTPS65400EVM-678 evaluation module for US$199. Texas Instruments offers the broadest portfolio of digitally enabled, configurable and fully programmable power controllers, providing customers with flexibility, efficiency and integration to meet dynamic system needs and reduce total cost. TI’s digital power solutions support various communication protocols, including PMBus, SMBus, I2C, SPI, UART and CAN. – Design a complete power management system online with TI’sWEBENCH Power Designer. – Search for solutions, get help and share knowledge in theDigital Power forum in the TI E2E™ Community. – Download power reference designs from TI’sPowerLab™ Reference Design Library. WEBENCH is a registered trademark and TI E2E and PowerLab are trademarks of Texas Instruments. All other trademarks belong to their respective owners.